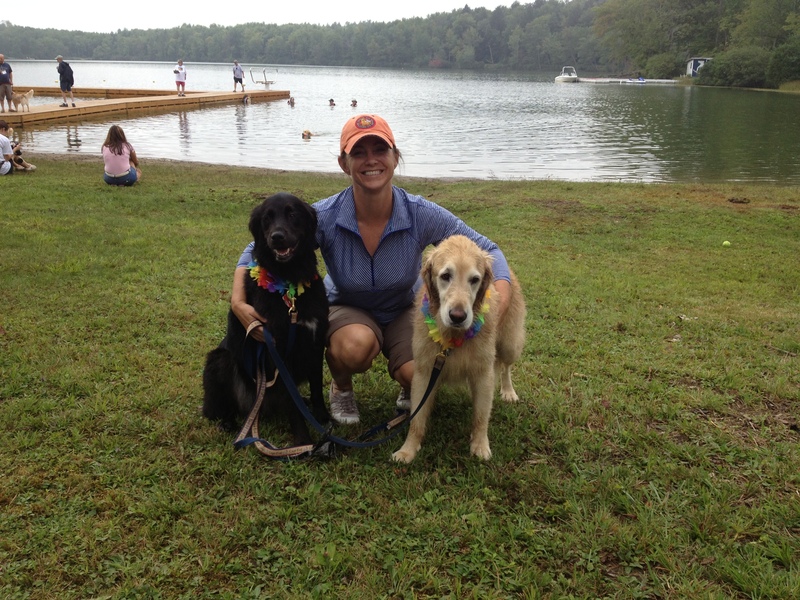 The girls and I had a blast at Goldstock Camp 2013 over Labor Day weekend. 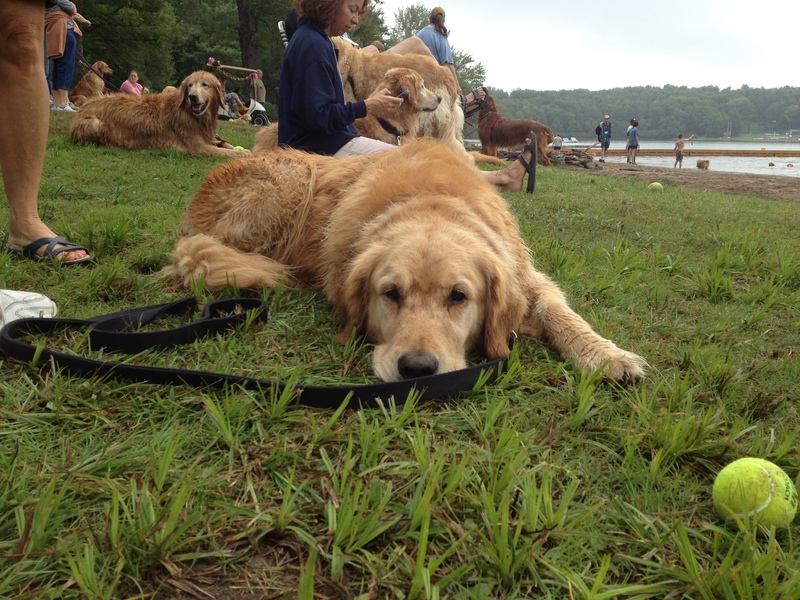 There were about 250 other Golden Retriever lovers and their dogs, and no, Sundae was not the only non-Golden. 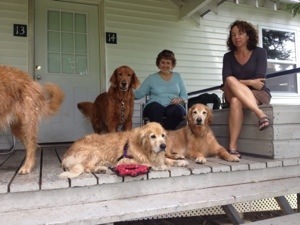 There were also Labrador Retrievers, mixed-breeds, and part of our cabin’s crew of four women and six dogs were two long-haired Dachshunds. The campers, some of who have been coming for each of the 16 years Goldstock has been held, embrace the event with enthusiasm. They decorate their cars. And, they decorate their dogs. OK, that’s Sundae leaning on Chatham, so I did the decorating in this case. 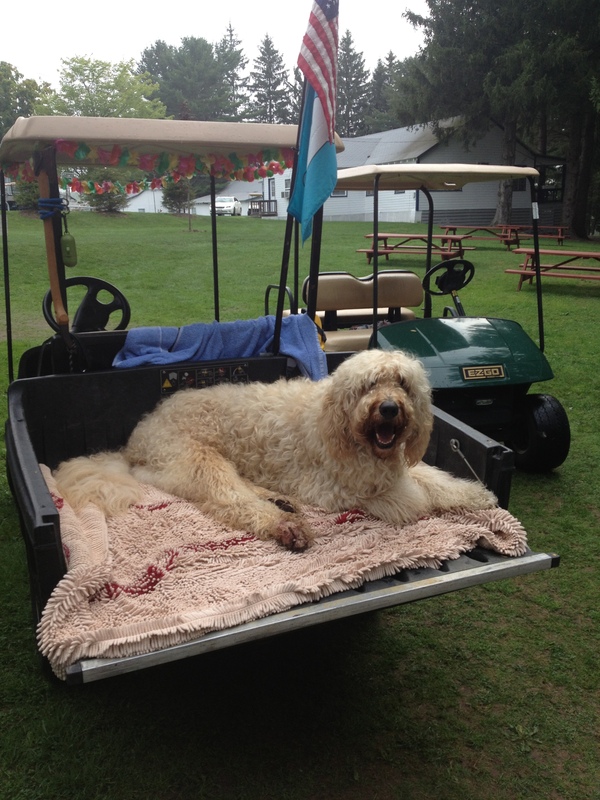 Golf carts seemed to be the primary mode of transportation, and they usually carried at least one very comfortable-looking dog. 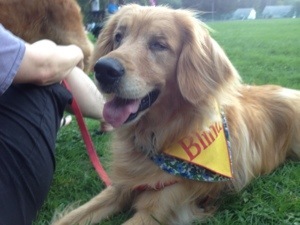 Then again, we’re talking Golden Retrievers here, folks. Everywhere you looked there were passed-out pups. Snuggling with their toys. Making sure tennis balls were safe. 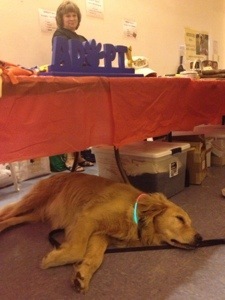 And this dog was “helping” staff the GRREAT (Golden Retriever Rescue, Education and Training) booth. All the rescue groups had space in the Activity Center where they sold merchandise throughout the weekend. 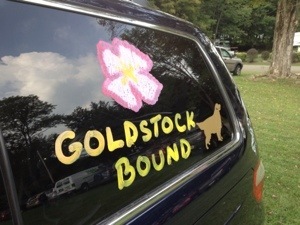 Goldstock is the primary fundraiser for the year for many of the groups. 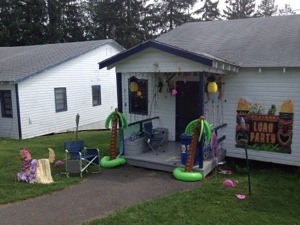 There’s merchandise sales, a silent and live auction, contests such as Sweetest Dog and raffles of gift baskets and other goodies. 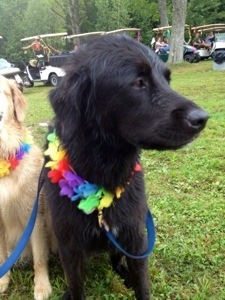 GRREAT dog Stevie won Sweetest Girl, bringing in more than $1,500 in donations. 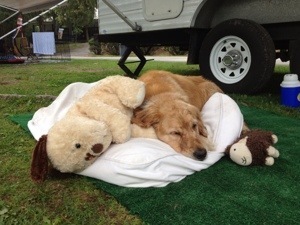 Stevie really is the sweetest dog, she’s a four and a half year old Golden who has been blind since birth. I love how fearless she is, eagerly greeting new dog friends with tail wags and sniffs, and cocking her head to better hear when humans tell her what a good girl she is. 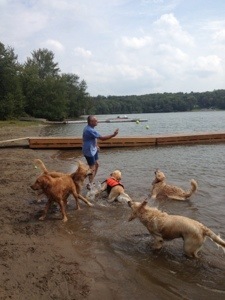 There were activities every day, including “serious” competitions such as Dock Diving and Fastest Retriever; fun competitions like Sassiest Walk; and demonstrations of Agility, Rally-o, bird retrieving, and more. 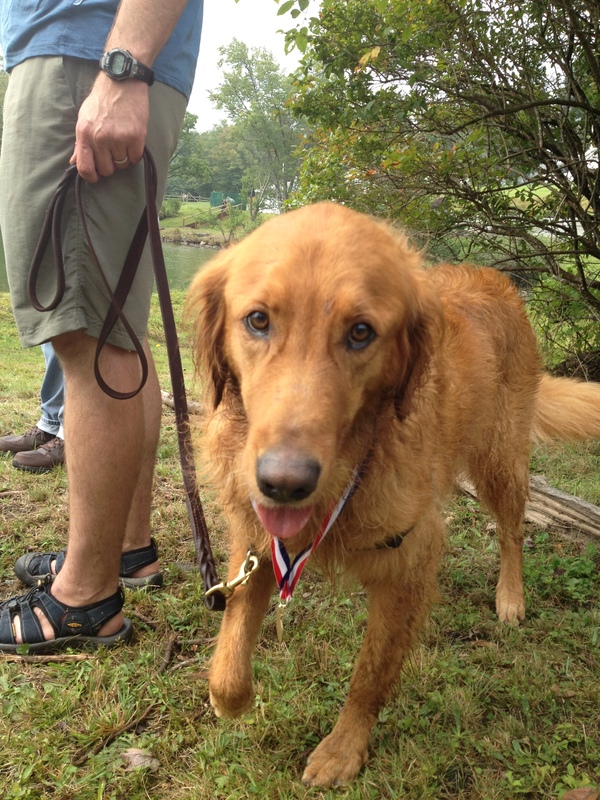 GRREAT dog Odie, who also belongs to Jessie and Dan, won Fastest Retriever with a laser-like focus when swimming out to beat all the other dogs to the tennis ball thrown in the lake. Here he is sporting his Champion medal. 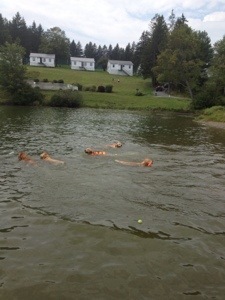 But campers found plenty of time to just hang out and relax, too. 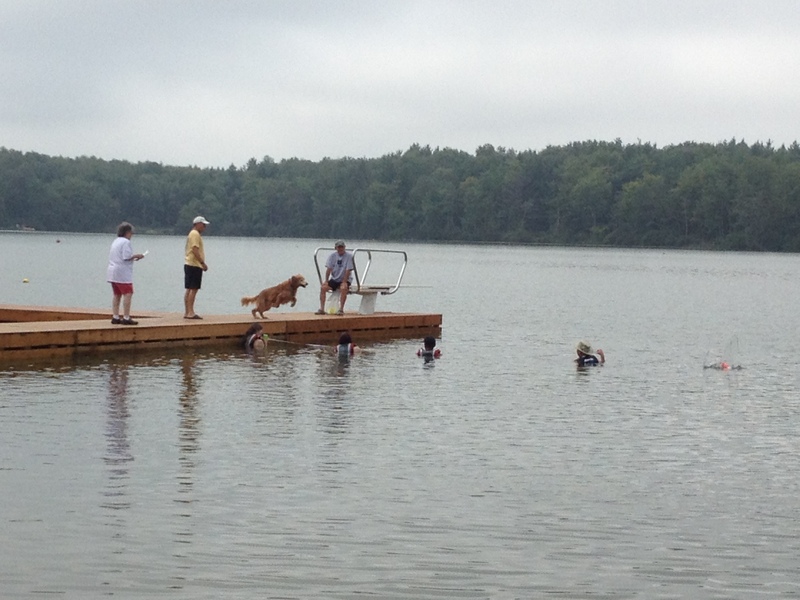 The highlight of the weekend for me, however, was unlimited access to the lake and docks. 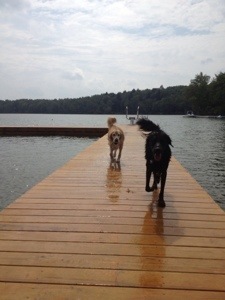 The girls spent many hours every day jumping off the dock after tennis balls. I have to say the accommodations were definitely rough. 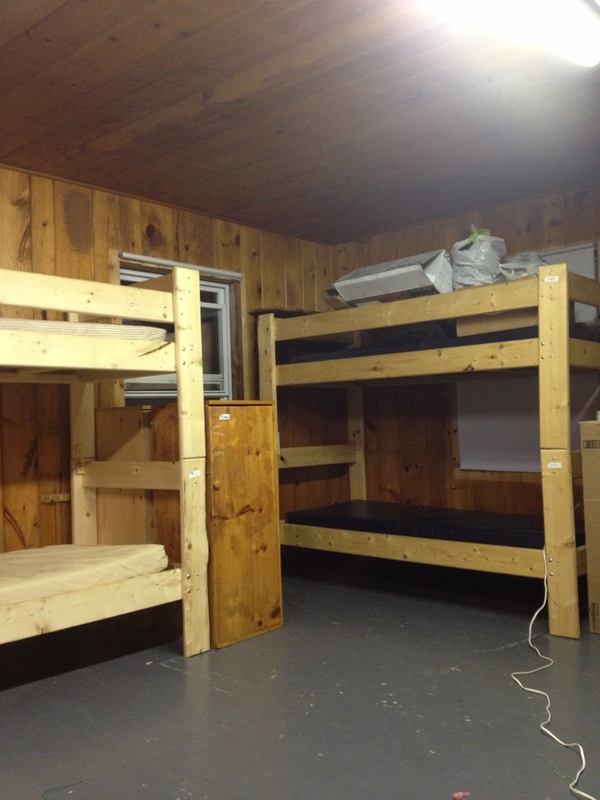 Not as bad as tent camping, but no air conditioning, showers that took forever to get warm, and bunks that seemed to attract my head like a magnet. I cracked my noggin so many times I fear there’s permanent damage. But the sacrifice of comfort was well worth it to spend a few days with some wonderful people who are so very passionate about saving dogs in need. Everywhere you looked there was a spoiled-rotten, happy dog. 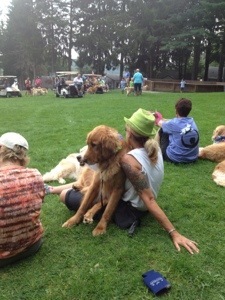 And that dog always had their person right there, enjoying spending quality time together. It put a smile on my face that lasted all weekend. Love your pictures in story form! Great job and it was fun reading and reliving our time at Goldstock. There is not anything else even close to Goldstock!! And you can’t even begin to explain to someone what it’s like…they just wouldn’t get it unless they experienced it (with a dog)!